There will be no Fourth Friday Walk-In Class in April. If you are interested in starting a beginner class or a trial class, please contact us at 910-644-0137 or email allamericanfencing@gmail.com. We dare you not to love it. We provide instruction and training for beginning, new, advanced, recreational and competitive fencers. 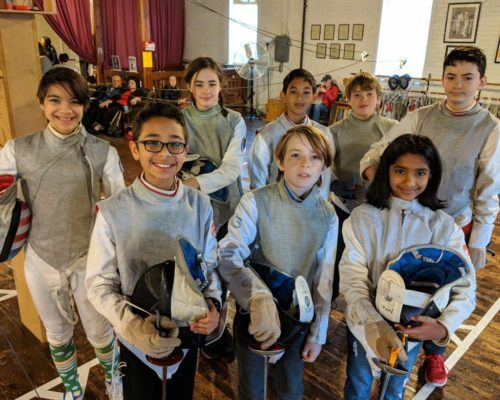 The All-American Fencing Academy’s goals is to introduce fencing to youth, teens, and adults interested in starting a new hobby and physical activity as well as training competitors to compete at the state and national level. Experience is NOT needed! Equipment is provided! The only requirement is the want to learn and have fun! We provide beginner classes for all new students. Classes are available for youth (starting at age 7), teen, and adults. Many of our fencers are recreational, some are competitive. Come visit and watch a class! 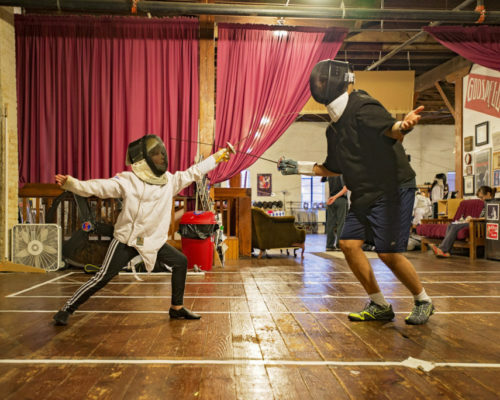 During Downtown Fayetteville’s Fourth Fridays, the All-American Fencing Academy hosts Walk-In Classes for anybody that wants to get a taste of a fencing classes before signing up for a full month. Walk-In Classes are only $10. No experience or equipment required. Great for families and friends, see you there! or our “Walk-In Fourth Friday” classes! Fencing provides great exercise, you get a chance to meet new friends, you learn a new skill, and it’s a great conversation starter. Kids apply discipline and problem solving skills learned at home and school; adults get to network in a small community. Our fencers learn how to succeed both in winning and in failure; teen fencers can continue to collegiate varsity programs. And let’s face it, we love to play with swords. Coach Gerhard will be at the club this Thursday, April 25, 2019 from 5:30-7PM for private lessons and open fencing. Hope to see you there! Open Fencing, Lessons, Closures, and Tournaments! The All-American Fencing Academy is an official registered school of the United States Fencing Association and the North Carolina Division of the United States Fencing Association. "If we can't protect the Earth, you can be damn well sure we'll avenge it." What's your super power? Find yours at the All-American Fencing Academy. Olympic fencing in the heart of Downtown Fayetteville. The All-American Fencing Academy provides instruction and training for beginning, new, advanced, recreational and competitive fencers. The All-American Fencing Academy introduces fencing to youth, teens, and adults interested in starting a new hobby and physical activity as well as training competitors to compete at the state and national level. Experience is NOT needed! Equipment is provided! The only requirement is the want to learn and have fun! We provide beginner classes for all new students. Classes are available for youth (starting at age 7), teen, and adults. Come visit and watch a class! We Dare You Not To Love It!